Settle into your new routine (and organize all that homework) when you build one of these 5 easy computer desks this weekend. It may not fall on the standard back-to-school supply checklist, but a simple and comfortable computer desk should definitely be a top priority once class is back in session. It’s the perfect spot for kids to get homework done and for parents to organize the various permission slips, flyers, and other papers that start to pile up come fall. While computer desks seen in stores and catalogs may come with a high price tag, many DIY alternatives are both easy to build and easy on the wallet. 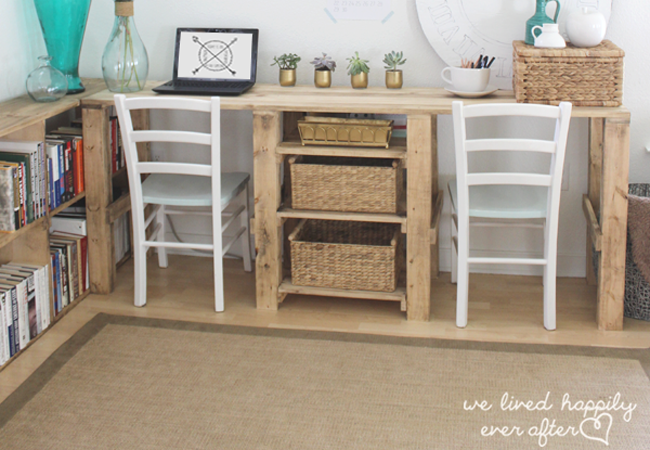 Check out these five achievable DIY desk ideas to get your inspiration flowing. If you’re looking for an option that’s equal parts cheap and sleek, look no further than this cleverly assembled design from Pretty Providence, constructed using a couple of Target bookcases and a tabletop from IKEA. The beauty of this arrangement lies in its simplicity: Just lay your tabletop on the floor and use a screwdriver to anchor the shelves into place. After that, all that’s left to do is flip the table over and fill it up. Easy! 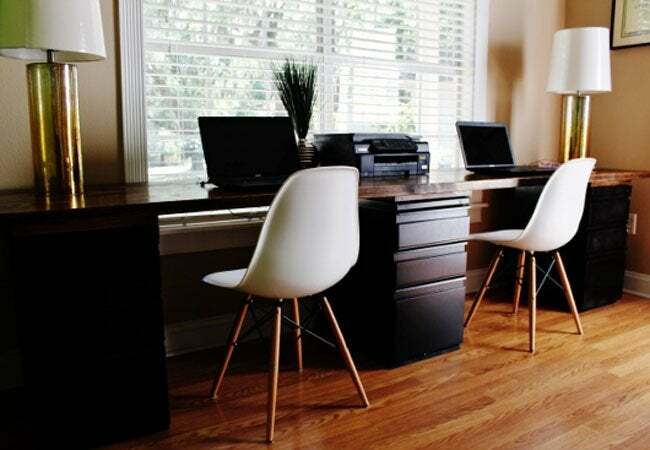 This custom-made desk from We Lived Happily After is built for two, making it an easy side-by-side workstation—or simply an ideal spot to spread out with a big project. The success of this project relies on careful measurement (and patience!) when screwing the wooden 1x4s and 2x4s into place. But once you have the frame built, the rest of the assembly will be easier than any of the work you do on it. 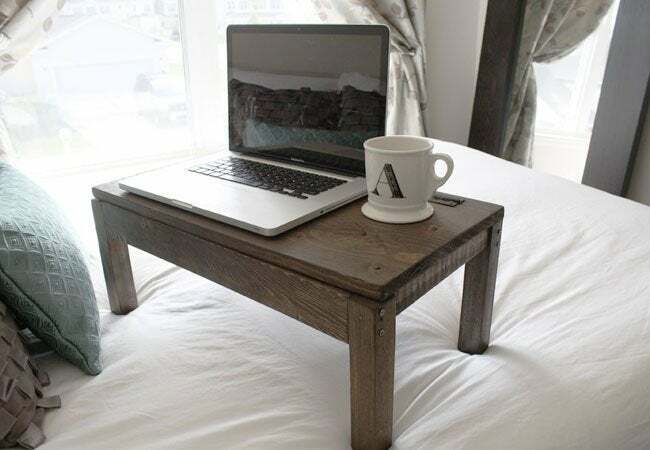 If you’re on the hunt for an option that’s portable and boasts a secret storage compartment, then this DIY laptop desk from The House of Wood is the genius solution for you—and it takes only about two hours to re-create. Round up a couple of 1×12 wooden boards for the storage bottom and hinged top, plus wooden boards for the legs, aprons, and trim. Once you’re done assembling, apply a thin coat of Rust-Oleum Ultimate Wood Stain (shown here in Dark Walnut) to give the design a luxe finish. 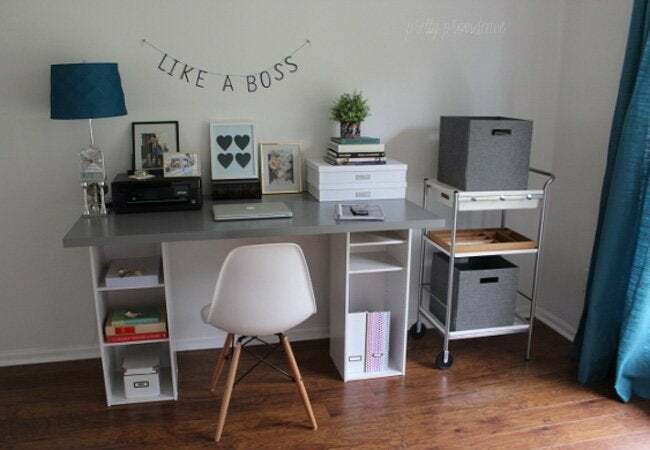 This DIY desk idea from Drab to Fab Design requires a bit of advance planning, but the end result is well worth the wait. The design team scoured Craigslist to find a matching set of filing cabinets that they could then turn into a custom-built desk for two. Once they found the perfect pair, the two got to work, attaching frames to the top and bottom of the cabinets to add a bit of height and hold the desktop together. After that, all that was left to do was add a tabletop, which can be created with a few 2x10s. 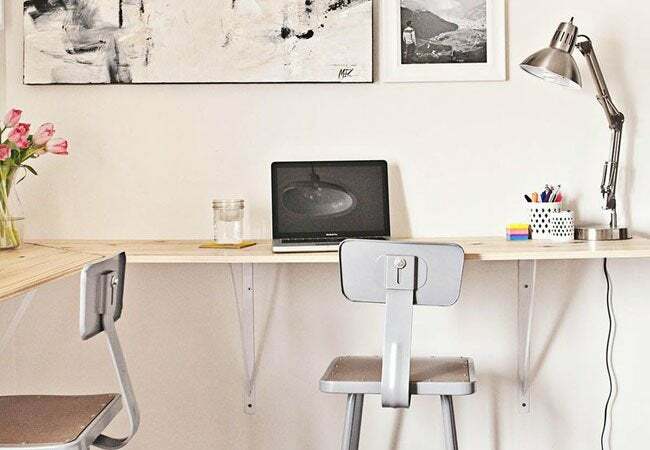 If you want a space-saving option that’s still an actual anchored-down desk, this wall-mount design from A Beautiful Mess is the perfect choice. All you’ll need are a few slabs of pine board, some shelf brackets, screws, and polyurethane. Using a saw, cut the boards to suit the size of the space where you plan to set up the desk. Then, sand down each board (this will help the polyurethane go on smoothly), and use the wall brackets to mount your desk to the wall. The next step is simply to pull up a chair and get to work!